This sign was painted on the west wall of the Greenwich Substation of the IND subway system built in 1932 at 13th Street where it intersects with Greenwich Avenue. Wellner Motors and Castle Garage were located a couple of blocks away on Jane Street and West 12th Street southwest of Greenwich Avenue. Both the Castle Garage telephone number Chelsea 3-6565 and the Wellner Motors number Chelsea 3-7600 first appeared in the New York telephone directory in 1937. It is possible the sign was painted around this time. At 245-247 West 12th Street the Kemwel Building was the site of Castle Garage. Constructed in 1910, the garage here was known as the 12th Street Garage from 1914 until the early 1920s. It was listed as the Castle Garage in the 1924 New York telephone directory and continued under this name until 1981. Wellner Motors seems to have come into existence around 1937 and also continued here under this name until 1981. Kemwell Automotive was first listed here in 1953, and the sign calling the building the Kemwel Building possibly dates from around that time. In 1958 Wellner Motors and Kemwell Automotive were included in an ad for New York GMC truck distributors. The founder of Wellner Motors and proprietor of Castle Garage was Emil Wellner (1892-1963). According to his World War I draft registration, Wellner was born in Vienna, Austria, 31 January 1892. He worked at that time as a bookkeeper for Henry Kelly & Sons, a produce dealer, at 413 West 14th St. He was recorded in the 1920 U. S. Census as a "fruit salesman," and it wasn't until 1930 that his occupation became "Manager, Garage." His involvement with the 12th Street Garage and its name change to Castle Garage seems to have taken place in the mid-1920s. The New York City Directory for 1925 listed E. Wellner as secretary-treasurer at Castle Garage Corp., 245 West 12th Street. I. Goldstein was president. Also listed as a member of Castle Garage Inc. was Emil Wellner's older brother, Alfred Wellner (1882-1943). Directories listed A. Wellner with Castle Garage from 1927 to 1943. Like Emil Wellner, Alfred Wellner, was born in Vienna and immigrated to the U. S. in 1893. His draft registrations in 1918 and 1942, as well as census reports from 1910 to 1940 record his occupation as Fruit Salesman. His involvement in the garage business may have been secondary. In 1953 Kemwell Automotive Corp. joined Wellner Motors and Castle Garage at 247 W. 12th St. This may signal the entry into the business of Emil Wellner's sons, Maurice Wellner (1916-1974) and Kenneth Wellner (1921-2011). They succeeded their father in the business after Emil Wellner's death in 1963. This notice appeared in the New York Times, December, 1974, regarding Maurice Wellner's death. Kenneth Wellner's obituary in the New York Times, 8 July 2011, pg. A21, read, "WELLNER--Kenneth, Age 90, a man who well lived several lives, and inspired many others, died unexpectedly on July 2 after a determined battle with multiple medical afflictions. A self-proclaimed Yankee Doodle Dandy, Ken Wellner passionately loved this country, its freedoms and its opportunities. The son of the late Emil and Freida Wellner, Ken graduated from Stuyvesant High School and attended NYU before joining the Army in December, 1941, serving in the CBI, achieving the rank of Major and receiving the Bronze Star Medal. He considered his military service the greatest privilege. In civilian life he joined Wellner Motors in NYC, the family enterprise, which evolved into a mega automobile dealership. He was President of the Automobile Merchants Assn of New York in 1958 and 1959, and eventually created and Chaired The Kemwel Group, a European car rental with close ties to the travel industry. Despite a debilitating motor neuron disorder, Ken Wellner was an avid sailor, a talented photographer and author of five privately published novels which he wrote while in his 80s. Ken Wellner was a deeply loyal friend, a man of insatiable curiosity, relentless humor and optimism, and undeniable charm. He never permitted his medical issues to interfere with living a full life, and became quite a terror on his scooter which provided mobility during his final year. He relished entertaining in his homes in Mamaroneck, NY; NYC; and Rancho Mirage, CA, and invariably provoked spirited political conversation. His own extraordinary spirit will endure in all who knew him. Ken Wellner is predeceased by first wife Barbara (Bronstein), second wife Eyrun (Herbertsdottir), brother Maurice and his adored son, Rick. He is survived by his wife and best friend, JoAnn (Giffuni) who he affectionately called Murgy, nephew Michael Wellner, niece Susan Merrett (Mark), and their children and daughter-in-law, Gabrielle Wellner. Donations in Ken's memory are suggested to NYU Langone Medical Center, ED Development, One Park Ave, 17th Flr., NY, NY 10016, attn: Donna Marino or to WNET-THIRTEEN, 825 8th Ave, NY, NY 10019 attn: P. Hayes, notating 'For the continuing production of Richard Heffner's Open Mind.' A celebration of Ken's life will be held at a later time." Kenneth and Maurice Wellner expanded the Kemwel business to include car rentals in Europe. Maurice Wellner's son, Michael H. Wellner, was the subject of a story in the New York Times, 21 Feb. 1888. He was president of Kemwel (now called the Kemwel Group) in 1988 when they were located in Harrison, NY. In the Times story Michael Wellner said that Kemwel moved out of its building on 12th St. in 1981. The Castle Garage sign was erased from the side of 247 West 12th Street approximately 2014. I last photographed it in 2012. 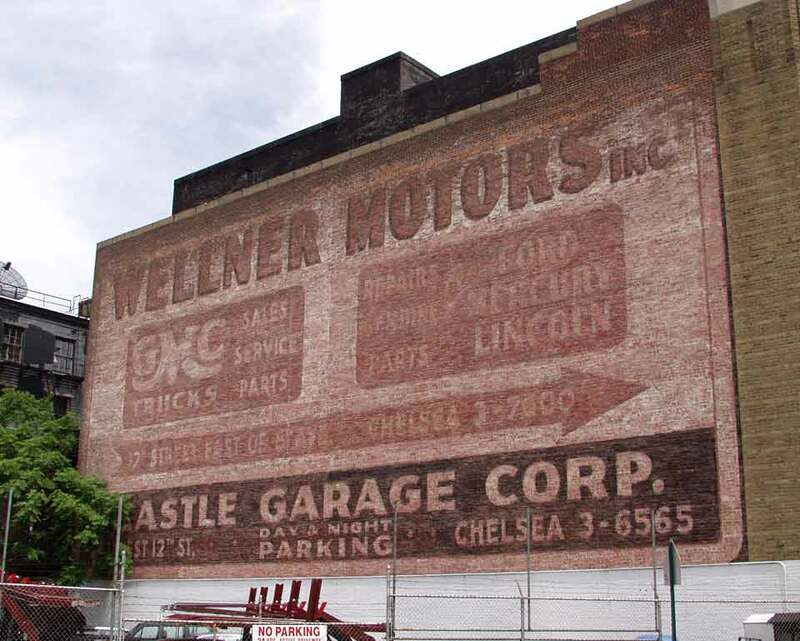 The Wellner Motors sign at 13th Street and Greenwich Ave. was covered over by new construction at the corner of 8th Avenue and Greenwich Ave. in 2008. I last photographed it in 2006.